Start off your simple skull drawing by sketching the eyeball in the eye socket. Do you notice how the eyeball is larger than the socket? That’s the reason why our eyes don’t actually go and bulge right out of our heads. The next thing to be aware of with the eyeball is how the eyelid falls on top of the eye ball. The upper eyelid naturally sits slightly above the horizontal middle point of the eye and the lower eyelid falls further below the horizontal midpoint. It sounds confusing to read as text, I know, but when you watch the video this is an important part to take note of. 2. 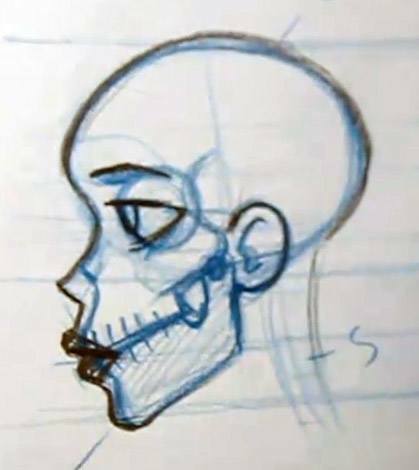 Simple Skull DrawingThe effect of how the eyelids wrap around the eye gives you a form where the lower eyelid is pushed in a little but more than the upper eyelid. You can see this most clearly from the side view. 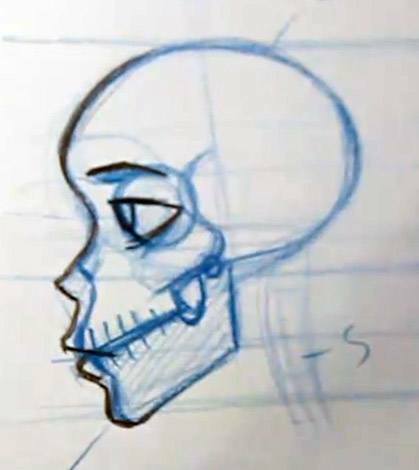 Check out this blog post on How to Draw a Skull if you need more information to help you get started. 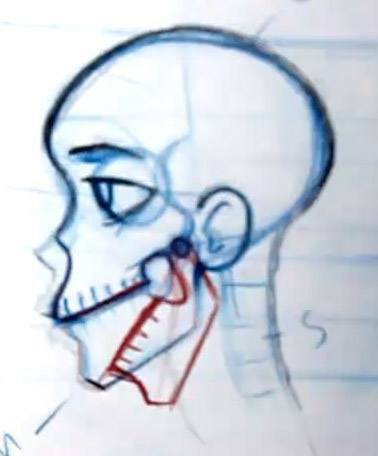 Start to draw over top of your skull where the skin would appear. 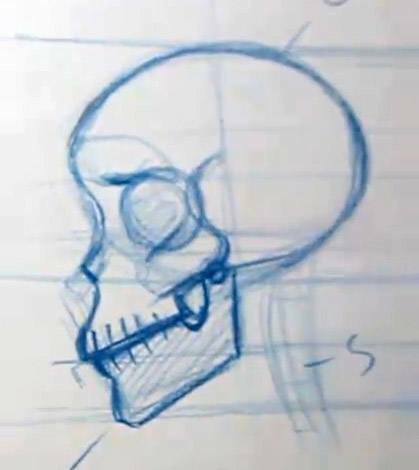 We’re not going to go over things in a ton of detail because it’s not necessarily needed for drawing cartoons, but there are areas between the skull and the skin that have more or less muscle and fat. The result of this is that you will have some areas like around the nose and mouth where the skin naturally pushes out as it covers the cartilage bone for the nose and the muscles around the mouth and lips. Take note that along the forehead and the chin there is very little music at all in these areas and the skin sits almost right on top of the bone here. Place the ears onto the head. The ear falls in the back half of the center of the circle that was drawn earlier for the skull. The top of the ear lines up approximately with the corner of the eye, and the lower part of the ear matches up with the hinge of the jaw, which is also in line with the bottom of the nose. Now that you’ve finished off the major features of the face, it’s time to move onto the neck. Earlier, you drew in some curved lines for the spine. And now, when you are drawing the skin that goes on top of it, you need to remember that the spine is not the only part of the neck. The spine does form the back of the neck, but in the front part there are many different parts that you need to keep in mind like the throat, windpipe, and not to mention all of the muscle and tendons that keep your head in place. So the lesson here is to remember not to make your throat too thin or it’s going to end up looking a bit strange if you are trying to create characters with a natural feeling to them. 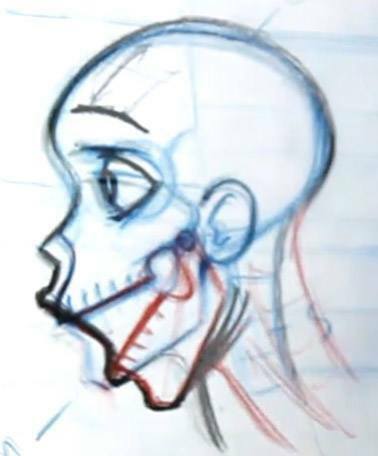 You’re going to learn how the jaw works in order to create an open mouth that is anatomically correct. 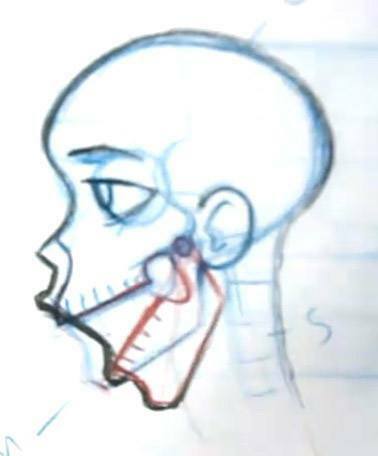 The first step to understanding how to do this is to examine how the hinge of the jaw works. There’s no real secret behind this – the lower jaw is just one solid piece of bone that swivels at the point where it attaches to the head right in front of the ear. When you are drawing an opened mouth, the jaw just rotates downward, but the actual shape of the jaw bone doesn’t change. Remember that the skin that sits on top is driven by how the underlying bone is positioned. Now that you have rotated the jaw downward it’s time to add the skin and lips on top of them. The skin can stretch quite a bit, but it still does have limitations especially when you are sticking to fairly realistic character construction. If you’re having some trouble visualizing this, now is a perfect time to get in front of a mirror and practice stretching your mouth open and taking notice of how the skin moves and what happens to the corners of the mouth as you move your jaw wider and wider. Try opening and closing several times while paying close attention. Remember that the skin along the chin doesn’t have much thickness between itself and the bone underneath. 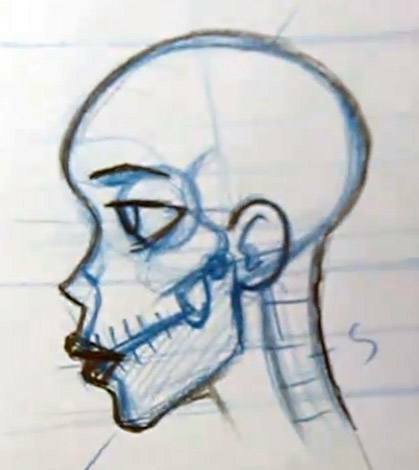 This is why it is important to understand how the bone structure is working under the skin so you will know exactly how to draw the skin on top. Continue to explore the opened mouth by drawing in the neck and the natural folds of skin that occur when the mouth is opened at an extreme position like this.